The Power Station is reimagining 29 acres of San Francisco's industrial Central Waterfront. 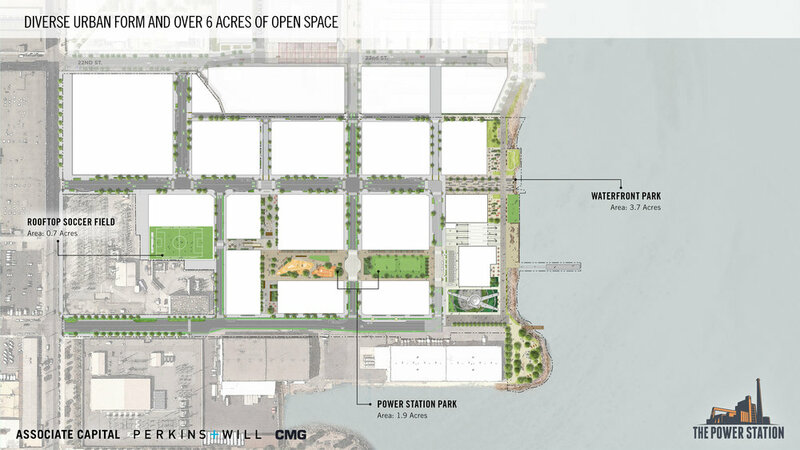 We join Pier 70, the adjacent development to our north, in creating a vibrant bayfront addition to the Dogpatch neighborhood with places to live, work, visit and play. The proposed project will be a majority residential, mixed-use and mixed-income neighborhood delivering approximately 2,600 homes; 600,000 square feet of office; 600,000 square feet of Research & Development; 100,000 square feet of retail; and ample community-serving amenities. Anchored by a 300-foot stack, the project will feature over 6 acres of parks and open space, a boutique hotel adapted from a former steam power facility, and community-serving restaurants, cafes, shops and stores, all coming together to create a new San Francisco neighborhood along the waterfront.